This organization works very well when you have large groups on the ice or a big difference in ability. The key is the players practice the skill and don’t have to wait in line a long time. Give instruction, move from group to group progress to games without the players having to switch stations. I have used this multi net in camps around the world with either no goalies, lots of goalies or a combination of big and little nets. 1. Put 2 to 4 nets on each goal line or you could have them along the boards practicing across the ice. 2. Players line up just inside the blue line or for older players outside the blue line. 3. One player defends while the first player in line skates around the other player and attacks 1-1. 4. When the play is over the original attacker skates out and defends vs. the second player in line. 5. When the play is finished the defender passes to the first player in line and skates out to close the gap. 6. Add an attacker and play 2-1 or 2-2. * You could have net at each red line to make 8 stations. Multiple Nets example from a camp I did in the Czech Republic. The defenders get passive support above the face-off circles while they play a low 2-2. The next defenders skate over the red line to close the gap on the next attackers. You can play this game position specific or everyone plays on offense and defense. 1. Half the players on each team line up behind the red line on both sides of the ice. 2. Two reds 1-2 start at the far blue line and attack vs. two blues 1-2. 3. Two players 3-4 from the defending red team follow the play inside the circle as wings would in their zone. 4. On a frozen puck, goal or breakout blue 1 or 2 pass to a supporting blue 3 or 4. 5. Blue 3-4 skate to the far blue line and turn back. 6. Red 3-4 skate over the red line and turn back to defend vs. the attacking blue 3-4. 7. Red 5-6 follow the play and give passive support for the breakout. *This transition game can be done from 1-1 to 3-3 and can be done from both ends at once. *If it is an uneven situation like a 3-2 one supporting player can join the low coverage and the other 2 give passive support. Play short shifts of 20-30’. Everyone keep their sticks on the ice. Pass to Jokers is allowed. You can play either Jokers must pass or also allow them to shoot. 1. Start with the red players on one blue line and white on the other and play cross-ice. 2. Coach spots a puck and players leave from their net end of the line-up. 3. Coach put in a new puck after a goal or the puck is out of play. 4. Modified rules can be added. i.e. one touch goals only. 5. Any even or odd combination of 1 vs. 1 to 5 vs. 5 can be played. * On the whistle either pass to the coach who spots the puck or pass to your team mate coming on. Man on man defense with the closest player defend tight from the defensive side, second closes within a stick length and third closest halfway. Offensive player start with a puck on the whistle. 1. Play 3 on 3 below the top on the circles. 2. Create 2-1’s on offense, use crosses and give and goes to confuse the defenders. 3. Defenders must communicate, have good sticks, switch, box out, take sticks in front. 4. Keep heads on a swivel. 5. Defend man on man. 6. Finish your check before the hash marks. Drive to the net from the middle lane and it takes a D to cover, another to defend vs. the puck carrier leaving the third player to be picked up by a back checker. The trailer is the fourth attacker on the rush, usually a defenseman. 1. Players start from one end and attack the other goal. 2. Start 3-0 with a coach taking away one option at the far blue line. 3. Options: wide lane pass off the pads, wing and centre switch, centre to wing to wide wing. 4. Repeat and two coaches defend at the far blue line and one coach defend the near blue line. 5. Start with a wing and centre switch when the puck is chipped out behind the first coach. 6. RG with D 3-0. 7. Attack 5-0 then coach spot a new puck in the neutral zone, regroup and attack 5-0 again. 8. Start with a 5-2 attack then regroup with a new puck and attack 5-2 again. Never lose defensive side and if beat wide turn inside and race to the near post because it is a 1/4 as opposed to a 3/4 turn. When doing any drill finish the play. 1. Start from diagonal corners. 2. Attacker start from the goal line and defender from the face-off circle. 3. Defender face the boards in an athletic stance with the lead skate turned to the inside, slightly turned toward the attacker. 5. Keep the attacker outside the mid-line of the body and the gap within a stick length. 6. If the attacker drives wide flare back a little and turn to skate forward, then angle to the corner. 7. If beaten wide then turn to the inside and head straight to the near post to regain defensive side. 8. After a shot box out the attacker and take his stick before looking for the rebound. 9. Move the defenders to start closer to the attacker. 10. Move the drill and attacker start from the blue line with the defender at the dot. Defender, goalie and back checker have to communicate who to cover. Attack quickly and make the first play near the blue line to force the defenders to make a decision and allow a second play. 1. Start with F1-F2 attack D1 and F3 back check from the corner. 2. D2 follow the play from along the boards in the neutral zone. 3. Next attacker F4 start from the corner with a puck when the play is over. 4. Back checker F3 transition to offense and F3-F4 attack vs. D2. 6. D3 follow the play. You can see the back checker not finishing the play and here are a few ideas to improve the drill. * Finish the play and the D make the breakout pass. * Another idea is to give a time limit to score, i.e. 8" then blow the whistle for next rep.
Defense shoulder check then pick up the puck and quickly move it up ice. If possible skate inside the dots before passing. Forward post up always facing the puck and time skating so he is moving when he gets the pass. Coach give passive resistance either at the blue line or back in. 1. Defense leave from the middle and pick up a puck spotted just inside the blue line. 2. Forward leave from the hash marks and post up ready for a pass when the D looks up ice. 3. Forward read coach resistance and fake inside, go outside if he defends the blue line. 4. Forward skate to the middle if the coach backs in and gives up the blue line. *Options: circle back for the next rebound, give and go with next shooter, defend 1-1 vs. next shooter. Defense get between the dots on the regroup with a quick up and only D to D if the first pass is denied. Forwards give support on the boards and in the middle. Everyone back track to the defensive zone. Forecheck F1-F2 in deep, F3 mirror from slot. 1. Coach spot a puck and 5 man unit does a neutral zone quick up. 2. Attack 5-2 with middle drive and D as the trailer. 3. Repeat from the other side with another quick up and 5-2 attack. 4. On the whistle players back track to a coach deep in the defensive zone. 5. D1 on the puck hard, D2 net front, F1 low support, F2 net front and middle point, F3 strong side point. Coach spots the puck below the goal line and the player goes back for it making an escape move to beat the forechecker. It is very important to shoulder check one way and read where the checker is coming from. Sell the fake to make the checker lean one way. Always skate away from pressure. 1. Start at the face-off dot skate forward to the top of the circle, coach spot a puck deep. 2. Skate backward and turn, shoulder check, fake then tight turn up ice and pass to the coach. 3. Skate to the top of the circle and repeat and tight turn the other way and pass to the coach. 4. Repeat a third time but now a coach or player forechecks. 5. Drive skate to the back of the net and wheel up ice cutting close to the post then pass to the coach. Defense must mirror the play and maintain a tight gap by skating forward and then using a chocktaw turn to skate backward and defend the blue line instead of backing in. 1. F1 and F2 leave from the red line D1 from the blue line on each side skate, D2 follow. 2. Go the other way on the whistle. 3. D2 pick up a puck at the blue line and pass to F1-F2. 4. D1 follow and maintain a tight gap with F1-F2. 5. F1-F2 on both sides attack 2-1 vs. D1. *Progress to F1-F2 carry a puck and regroup with D2 and then to a double regroup first with D1 then D2. Czech U20 doing a gap control drill. Turn backward. First do this drill without a puck and then with a puck. All players do both parts of the drill. Finish the drill with attacker going for the rebound and defender taking the stick and boxing out. 1. Attacker pass to defender . 2. Defender skate forward and pass to attacker. 3. Defender make a Chocktaw turn from forward to backward. 4. Attack 1-1 and go to the far corner. 5. When everyone is finished go the other way. Gaston teaching the Chocktaw front to back pivot. Video practicing the Chocktaw turn. Goalies, defensemen, wingers, centremen work on position specific skills. 1. Goalies are in the net at the same end as the wings and work in the crease area. 2. Centre’s take draws in the middle, pull the puck back, back to one side then the other and tie up the stick and scramble the draw. 3. Wings work on taking passes off the boards, then take the pass and tip back to the player swinging behind then repeat but protect the puck first. Take rims on the off wing. 4. Defensemen at one end work on going back for a puck, shoulder check then make and escape move and pass. Add a coach forechecks while another coach gets open for a pass to the middle or up the boards. Keep moving, give a target, skate in all directions, make forehand and backhand passes. Face the puck at all times and pass from the triple threat position. Add stick and head fakes before passing. 1. Pass from the blue line into the neutral zone in groups of three, usually a forward line. 2. Player 1 at a time skate and exchange three or four passes with 2, first player in line. 3. Rotate with the player 2 skating and exchange with player 3. Protect the puck, make moves, fakes, pivots in all directions. Keep your head up and avoid the coaches poke check. Goalies work with a coach at one end. 1. Players are in three lines on both sides of the neutral zone. 2. First player in each line handle the puck between the blue lines. 3. Coaches skate around and poke check at the puck. 5. Goalie coach work on technique. * Add pass to the players at the front of the line. * Exchange pucks with the other players in the middle. * Knock the puck off other players sticks. * Do Overspeed intervals of 5-10”. Strong bottom hand. Hit the ice behind the puck. 1. One touch shoot passes on each side from below the goal line. 2. Slap shot with snow behind the puck. 3. Shootout contest, keep shooting until you miss. 4. One time shot x 4. Skate forward exchange passes, backward on one timer. 5. One time forehand shot. 6. Quick shot after a pass from each side. Offensive players screen and tip when the puck is shot from behind the far net. Defensive players box out and seal the sticks to the outside. 1. Play a 2-2 or 3-3 cross ice game with two Jokers behind the defensive net. 2. If the puck is passed to the Joker behind the net then the Joker must shoot. 3. Play 30' and rotate the Jokers play, players leave and new players become Jokers. Attackers must move the puck quickly. Defenders challenge at full speed stop and start, stick on the puck. Coach fire in a new puck when the puck is cleared, frozen or a goal is scored. Two attackers on all loose pucks. Attackers an defenders rotate in on each whistle. Go through each defender once on the 5 on 1 and twice on the 5 on 2 then rotate so the other colour is on offense. 1. Play 5 vs. 1 at one end of the ice. 2. Coach pass to the power play who try to score. 3. One defender aggressively challenge the puck carrier. 4. Whistle each 10" and a new defender hustle in and original out of zone. 6. After each blue has defended once then they are on offense and reds on defense. 7. Add a second defender for 5 on 2. *This is a great contest for good habits on defense and learning to move with the puck and make quick decisions on the attack. I play two mornings a week with Bob Murdoch who coached the penalty kill vs. Bob Johnston's power play. They went to the finals that season after upsetting the Oilers. He said the pp would get so frustrated because they had a hard time scoring in this little game. He said the only way they could score is by 'one touch' passing' and that is a great skill to practice. Face the puck, give a target, pass hard, follow the shot, screen, shot pass, tip, point shot. 1. Defense starts in the middle and forwards from the corner. 2. F1 each side pass to D1, regroup and go in and shoot. 3. F2 pass to D1 and skate across the ice for a return pass then shoot from the other side. 4. D1 follow F2 to the blue line. 5. F2 get a puck from the corner and pass to D1 who shoots while F2 screens and F1 skates in for a shot pass. 6. Repeat with F3 and F4 regrouping with D2 on each side. Defense practice all of the options after a neutral zone regroup. Attack with the middle drive. Defense should join each rush and attack with four. 1. Three forwards take one shot each from the top of the circles, two defensemen at the point. 2. Coach spot a puck and the defense hinge and pass D to D.
3. Pass to strong side wing and the 3 forwards attack. 4. Repeat a second D to D and pass to the middle. 5. Repeat a third time and pass to the far wing. 6. Next unit of five come off the bench and do the same sequence passing to each lane. 7. Start from the other end. 8. Next rep the other D pick up the puck so it happens from each side. * Options: Include a trailer pass to the D on the attack. Have the forwards get the next puck and regroup with the D.
D shoulder check then make a hard fake and pick up the puck. Make crisp passes. Hit the net. Rebound for the shooter after passing to the point. 1. Defensemen at the blue line. 2. D2 dump the puck in and D1 skate up to the blue line then back and get the puck. 3. D1 pass up to D2 at the point who passes across to D3 who shoots D1 look for a rebound. 4. D2 skate from the top of the circle to the blueline and back then get the next puck D4 shot in. 5. D4 pass across to D2 who shoots and then goes back to make the next breakout. 6. Drill goes side to side, shoot-make the breakout pass-D to D and shot-repeat. 7. Add another D and now make D to D passes, either over or reverse. 8. After the D to D and point shot the two D at the point do the next breakout. 9. Make a breakout from each side and shot from each point then shooting D breakout. 10. Work on all the breakout options. Jokers move around to get open. Make passes quickly. Coach can implement modified rules. 1. Two teams with half playing and half as Jokers. 2. Either timed rotation or switch on their own. 3. You must pass to a Joker to go on offense. 4. Jokers can shoot or pass. Create checking angles, use controlled skating, keep defensive side. Attackers use deceptive skating, fakes, protect the puck and shoot under pressure. 1. One attacker and one defender leave from the top of the circle and battle for a puck dumped in by the coach. 2. Defender compete to carry the puck out of the zone and attacker battle to score. 3. At the other end player battle starting from along the boards at the blue line. 4. The attacker gets a pass from the coach while the defender creates and good checking angle from the inside. 5. Attacker use deception, change of speed and protect the puck to go to the net. 6. Defender create a good angle and keep defensive side with the stick on the puck. 7. Change the 1-1 to a 1-2 forecheck battle. 8. One attacker pick up the loose puck and go to the net. 9. First defender play the body and the second defender pick up the loose puck and skate out of the zone. Players must transition to attack and defend in each situation. Communicate on defense and support on the attack. Either pass the original puck to the coach or shoot it out of the zone to avoid injuries. 1. Three sets of offensive and defensive players spread out in the zone. 2. Coach passes to one offensive player and he attacks 1-1. 3. On whistle pass to the coach and he passes to another player to activate a 2-2. 4. Whistle and pass to the third player to activate a 3-3. Angle from a little behind at the back outside shoulder, inside leg in front, stick on the puck and skate through the hands, lift the stick and take the puck. 1. Player one stands below the hash mark on the boards and get a pass from coach below goal line. 2. Player two skates around players inside the circle and use controlled skating to approach the puck carrier. 3. Player two skate through the hands and take the puck from player one then pass to the coach. 4. Player one now circle and check player three who moves to the boards and gets a pass from the coach. Always go back for the puck with the intention of beating the first checker. Shoulder check to read where the forechecker is. Communicate where the outlet pass should go. Fake to make the checker commit and then skate away from pressure. 1. Start with one defender vs. one forechecker. 2. Coach dump the puck in from the top of the circles. 3. F1 try to score and D1 to carry the puck out. 4. Add another defender F2 to support for a breakout pass. 5. F2 communicate to D1 where he should pass. 6. Play until the puck is carried out, a goal scored or the puck is frozen. Option: Progress to a half ice transition game where the defenders pass to a new F who skates through the middle circle, dumps the puck in and forecheck vs. D1 and F2. This is a link to practice ideas that higher level teams from elite youth, U20 to North American and International pro teams do at practice. It has been updated with the practice ideas from the last two years. Over 600 PDF's diagrams and descriptions with video links from this coaching site. A lot of very good ideas. Coaches from all over the world contribute to Enio Sacilotto's club. The link has been on this site for a long time and there are lots of great ideas for practice. 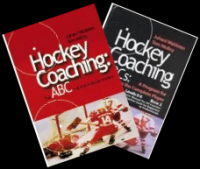 Each coach posts 4 drills or games, recommend a book and give a quotation. I have added this years drills. Over a hundred from coaches of all levels but most are college, European pro, and higher level minor hockey. Great material. These guys are a lot smarter than I am. Fight on offense to gain net side and on defense to defend from the net side. On the breakout vs. a forechecker the first one back must un-weight the checker with a fake and the supporting player must get open for the best outlet pass. 1. Coach pass the puck to player 1 near the blue line on the boards. 3. Player 1 try to score while player 2 defends and try to pass to the coach. 4. When the play ends player 1 now defends vs. player 3 who gets a pass from the coach. 1. Player 1 and 2 break out vs. 3. 2. Coach spots a puck and 3 retrieves it vs. pressure from 1-2. 3. Player 2 support in a board battle or get open for an outlet pass. Absorb the puck and wrist pass it back instead of slapping the puck. 1. One player pass while skating around the circle facing a coach or another player. 2. Go each direction once then switch.